Going on spring break (or just wish you were)? Why not pick up the Spring Break expansion for Chez Geek House Party Edition and prepare yourself for what might be coming? 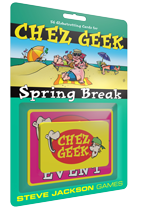 Chez Geek: Spring Break is fully compatible with our first expansion, Slack to the Future - but you can play either of them without the other - and features amusing (and occasionally disturbing) art from Greg Hyland. If you want to add your own adventures to the game, you can find Chez Geek blank cards at Warehouse 23.